When shopping at Buzzoutlet e-Commerce you will save up to 60% off retail prices on quality branded products. This saving doesn't mean you have to compromise on any of the normal ‘technical features or innovations’ you are accustomed to when shopping in a specialized hardware store. We offer a 1 Year Nationwide Warranty to ensure you always pay the lowest prices for the best products. 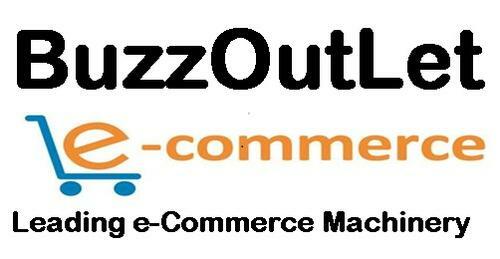 Buzzoutlet e-Commerce is Owned & Operated by David E Cockburn. All payments to be made out to David E Cockburn. Our preferred payment is CREDIT CARD, as we can generally dispatch the item within 24-48 hours & we bank with National. We bank with NAB, simply by login to your online banking or drop by a NAB branch & transfer the balance. As one of Australia’s leading e-commerce Machinery Company, Buzzoutlet e-Commerce enables commercial and domestic tools to be viewed & bought by people, online 24/7. Proudly Australian owned and operated, the family at Buzzoutlet e-Commerce is dedicated to providing you with the very best value for your time and money. 30 Day money back offer included, (conditions apply) - email office for full details. We offer our own 12 month warranty against defects on all items sold by Buzzoutlet e-Commerce. 12 MONTHS WARRANTY ON ALL ITEMS. Send an email (bolcommerce@gmail.com) stating your order number, ad Number from listing, the item/s you wish to return, and the reason for the return - At least 3 Photo's must be submitted. Our Customer Support Team will review your email and, if applicable, issue you a Return Authorisation (RMA) number which must be included on the address label. All other relevant information will be sent to you at this time. - BuzzOutLet e-Commerce will not accept the return of any item/s without an RMA attached. If your item was purchased in error, or you've simply changed your mind, it may not be too late for a refund. To see if you are eligible please check below: We must be notified within 30 days of you receiving the item that you intend to return it. •That you DO NOT stick or write anything on the item itself or its packaging. Please only write or place postage stickers on the outer postage packaging. •The item is securely packed to ensure it is received back by us in original and re-saleable condition. •Handling fees will apply: $9.95 0-25kg / $19.95 25+kg. Either of these will be deducted from the refund provided. •The refund amount will also have original freight costs deducted. If the item was sent with free postage, a 20% postage fee will also be deducted from the refund amount. •If the item has sustained damage in transit, or does not return as noted above, a revised refund amount may be required. •Any refunds shall be paid EFT less any credit card fees. •Our Customer Service Department will review your email and, if applicable, issue you a Return Authorisation (RMA) number which must be included on the address label. All other relevant information will be sent to you at this time. We offer our satisfaction Guarantee & Warranty from the date of your item being couriered to you for a period of 12 months.. This warranty covers all products used for private household use from the date of purchase. The use of products for commercial purposes qualifies the purchaser to a 3 month warranty period. Many parts are readily available to our customers should any issue arise. We warrant that all products are free from defective material and workmanship and agree to replace any part that proves to be defective; without charge. The design of the window printed pattern may vary depending on available stock. Gazebos / Marquees should be considered as a 'temporary structure'. Note: The tent/gazebo are not designed as permanent structure and it is not recommended to be used under weather conditions or for a period of time. Whilst BuzzOutLet e-Commerce makes every reasonable effort to present accurate information on the Web Site, the information may contain typographical errors or inaccuracies, errors with images and may not be complete or current. We therefore reserve the right to correct any errors, inaccuracies or omissions and to change or update information and supply items at any time without prior notice (including after you have submitted your order and/or made payment). Such errors, inaccuracies or omissions may relate to product description, pricing and availability. If, for example, the price or description of a product offered for sale on the Web Site is incorrect due to a technical or administrative error, any agreement arising from any acceptance of such offer will, in BuzzOutLet e-Commerce discretion, be void. We also reserve the right to limit quantities (including after you have submitted your order and/or made payment). We apologize for any inconvenience this may cause you. If you are not fully satisfied with your purchase please see our returns policy for details on how to obtain a refund. David E Cockburn Privacy Program, is an independent business whose mission is to build users' trust and confidence in the Internet by promoting the use of fair information practices. This privacy statement covers the web site buzzoutlet.machines4u.com.au Because this web site wants to demonstrate its commitment to your privacy, it has agreed to disclose its information practices and have its privacy practices reviewed for compliance by TRUSTe. If you have questions or concerns regarding this statement, you should first contact bolcommerce@gmail.com. We use outside shipping companies to fulfill orders, and a credit card processing company to bill you for goods and services. These companies do not retain, share, store or use personally identifiable information for any other purposes. These third parties are prohibited from using your personally identifiable information for any other purpose. This Web site may contains links to other sites that are not owned or controlled by David Cockburn. Please be aware that we are not responsible for the privacy practices of such other sites. We encourage you to be aware when you leave our site to read the privacy statements of each and every web site that collects personally identifiable information. In order to make a purchase on the site we may only collect your personal details but never store credit card details. Your personal contact information online such as names, postal and e-mail addresses, phone numbers will be stored online & used to process your order only. We may use third-party tracking services that use web beacons to track non-personally identifiable information about visitors to our site in the aggregate. We reserve the right to modify this privacy statement at any time, so please review it frequently. If we make material changes to this policy, we will notify you here and via a prominent notice's from time to time only.